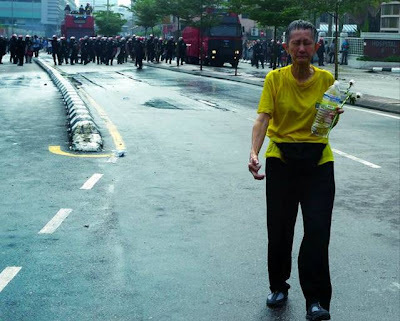 To the PM, Home Minister and IGP, do you still deny that the police used violence on the protestors? None are so blind as those with sight but do not see the truth. All coverage of the 9 July rallies have been given the whitewash treatment by the MSM. You will never see images like these in the MSM. Kudos to all the photographers, local and foreign, who braved the tear gas, water cannons and truncheons to bring us these images. “Why do we have to feel so scared (and threatened) in our own home land.. and by own countrymen?” asks Auntie Anne, 65. She was one of the many thousands who joined the street march despite the heavy presence of the riot police and the risk of getting arrested. 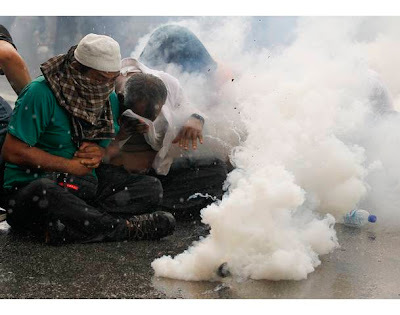 minister : " ... the wind blew the smoke to the TS hospital , pls dun blame the polis , ok ! " NO lah , it's the HAZE , pls dun blame the smoke , ok !? RICH OR HAPPY - WHY NOT BOTH? WHAT IS AN OLDER WORKER WORTH?